We get a lot of questions about Israel border crossing. It’s very common to combine Israel and Jordan as travel destinations and somewhat common to combine Israel and Egypt. Israel shares land borders with four countries, Lebanon, Syria, Jordan and Egypt, but the only border crossings are with Jordan and Egypt. The Egyptian border crossing is from Eilat, Israel to Taba, Egypt on the Sinai Peninsula. It’s the easiest border to cross, but we don’t recommend traveling in the Sinai right now; it’s not safe. From here on out we will move first in an easterly direction, from Israel to Jordan, then back again. Any mention of visa requirements refers to Americans. Also, visa costs and procedures can and do change abruptly. We’ll strive to keep this post updated but, if you’re planning a cross-border trip, please contact us directly for the most current border information. Crossing into Jordan, there are three options. Yitzhak Rabin/Arava Border in the south is about 3km north of Eilat. We use it mainly for travelers doing a day trip from Israel to Petra but logistically it’s the most convenient border to Eilat and the southern Negev in Israel and Aqaba, Petra and Wadi Rum in Jordan. – Pay Israel border tax. – Walk across the border (about 100 meters, there are trolleys for luggage). – Pick-up your vehicle and be on your way. – Pay Jordan border tax. – Walk across the border. Aside – Petra entrance fees are 50% higher for day visitors than they are for those spending at least one night in Jordan. 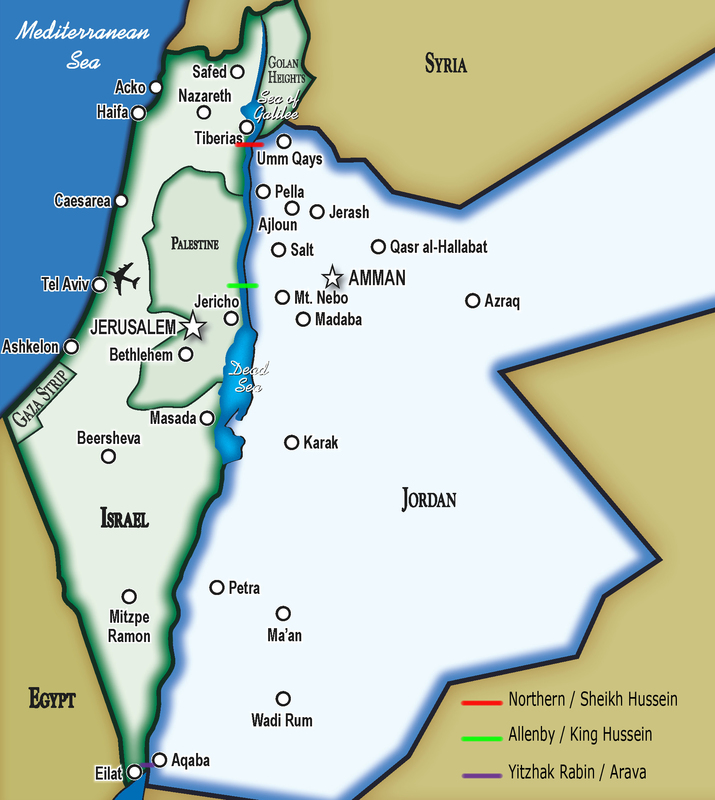 Northern/Sheikh Hussein Border is closest to Tiberias in Israel’s Galilee region and the Roman site of Jerash in Jordan. – Take a public Israeli bus across the border (pay fare in shekels, buses run every 30-40 minutes). – Clear Jordanian Immigration (visa may be purchased on the spot, contact us for current cost). – Schlep your luggage to another building and clear Jordanian Customs. – Take a public Jordanian bus across the border (pay fare in Dinars, buses run every 30-40 minutes). Allenby/King Hussein Border is closest to Jerusalem, Tel Aviv, Amman and airports. This one is tricky because it’s the only border where West Bank Palestinians are allowed to cross. That means a lot more traffic and much tighter security. Also, it closes on Fridays and Saturdays at 11am, much earlier than the other borders. Israelis are not allowed to cross here. – Clear Israeli security (yes, there is Israeli security on both sides of this border). – Take a public Israeli bus across the border (pay in shekels, buses run every 30-40 minutes). – Take a public Jordanian bus across the border (paying fare in Dinars). – Pick up your vehicle and leave that border in your dust. If it’s so troublesome, why use this border? It’s really the most central crossing, closest to the major cities and airports of both countries. Our best advice is to leave yourself plenty of time, especially if you have a plane to catch. It’s very hard to estimate the time needed to cross any of the borders because we can’t know how many people might be crossing at any given time. If you get stuck behind a tour group, that can really slow things down. In such a case, don’t hesitate to ask nicely to go in front of the group. At Arava and the Northern Border there is free parking on the Israel side, where you can leave your car for several days. Israel border tax must be paid in Shekels. The current cost is 100NIS at Arava and the Northern Border and 173NIS at Allenby. Jordan border tax must be paid in Dinars. The current cost is 8JD. If purchased at the border, the Jordan visa must be paid in Dinars. the current cost is 20JD. We include the Jordan border tax and visa in all of our published programs that include Jordan. This entry was posted in Israel, Israel border crossing, Jordan, Uncategorized and tagged Amman, Aqaba, Egypt, Eilat, Israel, Israel border, Jerash, Jerusalem, Jordan, Jordan border, Petra, Sinai, Sinai Peninsula, Taba, Tel Aviv, Wadi Rum by yalla2013. Bookmark the permalink.